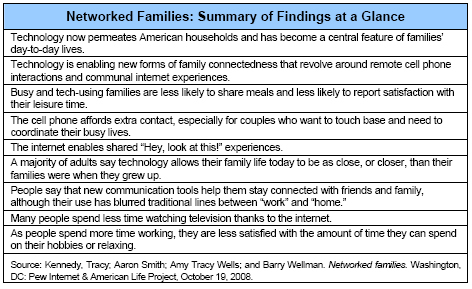 American families are using a wide range of communication media to keep in contact with each other. Married couples with minor children stand out because they have higher rates of internet and cell phone usage, computer ownership and broadband adoption than other household configurations. 58% of those living in married-with-children households own two or more desktop or laptop computers. Nearly two-thirds of those living in multiple-computer households (63%) link those computers in a home network. Both spouses use the internet in 76% of married-with-children households, as do 84% of their children aged 7-17. Indeed, 65% of married-with-children households with a child between the ages of 7-17 contain a husband, wife, and child who all use the internet. 89% of married-with-children households own multiple cell phones, and nearly half (47%) own three or more mobile devices. Children in these households are somewhat less likely to own a cell phone than they are to go online: 57% of these children (aged 7-17) have their own cell phone. Although some commentators have expressed fears that technology pulls families apart, this survey finds that couples use their phones to connect and coordinate their lives, especially if they have children at home. American spouses often go their separate ways during the day, but remain connected by cell phones and to some extent by internet communications. When they return home, they often have shared moments of exploration and entertainment on the internet. This new connectedness via cell phone and screen-sharing is correlated with some benefits for family life. For example, those with the most technology are more likely to share moments with family members while they are online and to exchange some kinds of family communications such as checking in with other family members and coordinating activities. There has been a major swing to cell phone use among American couples; more use a cell phone to be in touch daily than a traditional landline phone. Some 47% of married couples contact each other once a day or more using a cell phone, and 35% do so using a landline phone. Couples use communication technologies such as the internet and cell phones primarily to say hello and chat and to coordinate schedules and daily routines when they are physically separated. Cell phones also seem to increase the frequency of certain kinds of communications between couples. Compared with less tech-heavy households, married couples in which both partners go online or use a cell phone contact each other more frequently than couples who have less technology. 70% of couples who both own a cell phone contact each other once a day or more to say hello or chat; 54% of couples who have one or no cell phones do this at least once a day. 64% of couples who both own a cell phone contact each other at least once a day to coordinate their schedules; 47% of couples who have one or no cell phones do this at least once a day. Parent-child communications, particularly on a daily basis, are similarly dominated by the telephone: 42% of parents contact their child/children daily using a cell phone, and 35% do so using a landline telephone. Although families often have the means to retreat to their technological “neutral corners” and engage in screen time in isolation, many go online with others. Some 52% of internet users who live with a spouse and one or more children go online with another person at least a few times a week. Another 34% of such families have shared screen moments at least occasionally. Additionally, families that own large quantities of televisions and computers are no less likely to share screen time with other family members than those families that have lower levels of technology ownership. While new communication technologies have increased the amount of time some people spend at the office or working from home, few people see them as having a negative impact on family closeness. Indeed, 25% of our survey respondents feel that their family today is now closer than their family when they were growing up thanks to the use of the internet and cell phones, while just 11% say their family today is not as close as families in the past. A majority of adults downplay the impact of technology at all: 60% feel that new technologies have not made their family any more or less close than families in the past. Overall, respondents in this survey see much upside and little downside in the way new communication technologies, such as the internet and cell phones, have impacted the quality of their communications with others. Furthermore, 33% of internet users say that the internet has improved their connections to friends “a lot,” and 23% say it has increased the quality of their communication with family members by a similar amount. They say these improvements are particularly useful for keeping in touch with extended family members who may live many miles away. Young people in particular take advantage of the social side of the internet: 21% of wired 18-29 year olds say the internet has greatly improved their ability to meet new people, and 49% say it has improved their connections to friends a lot. However, this increased connectivity seems to come at a cost for some adults; 11% of employed internet users say the internet has increased the amount of time they spend working from the office, and 19% say it has increased the amount of time they spend working from home. Most internet users say that the internet has not changed the amount of time they spend with friends, with family, and attending social events or activities. However, 25% of online adults say that the internet has decreased the amount of time they spend watching television. Television has diminished importance, and the internet has enhanced importance, especially among younger adults. When they spend more time working, people tend to give their remaining free time to their families. This often comes at the expense of time spent relaxing or engaging in hobbies or other activities. While half (49%) of employed adults are very satisfied with the amount of time they spend with their families, just one in three are very satisfied with the amount of time they have available for relaxing, for hobbies, or for clubs or other activities.